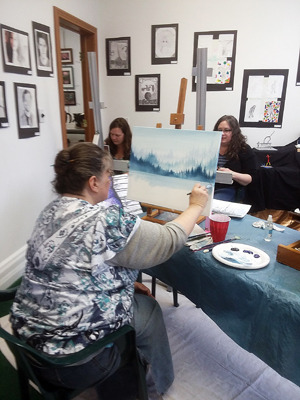 (Clockwise from left) Kelly Shoemaker, Tammie Davis and Brandi Veach were among those who participated in the open studio March 9 at Lakeland Art Center & Gallery in Warsaw. The next open studio is Saturday. Saturday – Open studio. noon to 4 p.m.; reception for artists Kelly Shoemaker, Paul Raiman and Stephanie McDairmant, 4:30 to 6:30 p.m.
April 20 – Acrylics class, 1 to 4 p.m. Taught by Tammie Davis. April 28 – LAA accepting entries into the 14th annual Spring Juried Show, noon to 6 p.m.
May 1 – Spring Juried Show opens to the public. The Lakeland Art Center & Gallery is planning another open studio from noon to 4 p.m. Saturday. That same afternoon, from 4:30 to 6:30 p.m., an artist reception will be held for Kelly Shoemaker, Paul Raiman and Stephanie McDairmant. Those who attend are invited to bring a treat to share while visiting with the artists. There is no cost to attend either event. Everyone is welcome. The mission of the Lakeland Art Association is to further the visual arts in Kosciusko and surrounding counties by challenging the creative spirit of local artists and community residents. LAA strives to nurture its artist members through opportunities for camaraderie, skill development, the sharing of creative endeavors and public exhibits. LAA is also committed to encouraging the next generation of artists and potential art enthusiasts by promoting and supporting visual arts education and events. Contact the Lakeland Art Center & Gallery at lakelandartassociation@gmail.com, 574-267-5568 574-457-6085 with any question.